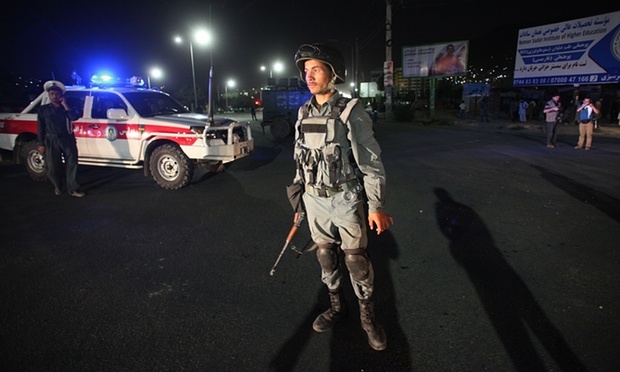 A few hours later, another two explosions went off in the Qasaba neighbourhood north of the airport, followed by sporadic gunfire, when insurgents tried to storm a US special operations base known as Camp Integrity. One service member was killed, as were eight civilian contractors and two insurgents, according to Col Brian Tribus, a spokesman for international forces in Afghanistan. “A coalition facility [Camp Integrity] was attacked at 10.15pm, 7 August. One Resolute Support service member and two insurgent attackers were killed,” Tribus said in a statement, without providing more information. The individual is the fifth international service member killed in Afghanistan this year. The Afghan capital had been on alert since early on Friday, when a massive truck bomb exploded outside an Afghan army base in a residential area called Shah Shaheed, close to the centre of Kabul. The attacks add to a rising number of civilians caught up in the violence of the war. In a new report on Wednesday, the UN said civilian casualties were higher than at any point during the war in Afghanistan. During the first six months of 2015, almost 5,000 civilians were killed or wounded.